Ahhh December. December is a month filled with magic and excitement. December has an energy to it unlike any other month. For me, December has always been extra special as it holds my birthday within it’ s calendar and now December holds Lily’s birthday as well. On December 2nd, Lily turned two! Yes, December is a beautiful month filled with blessings and memories but there is a darker side to December. 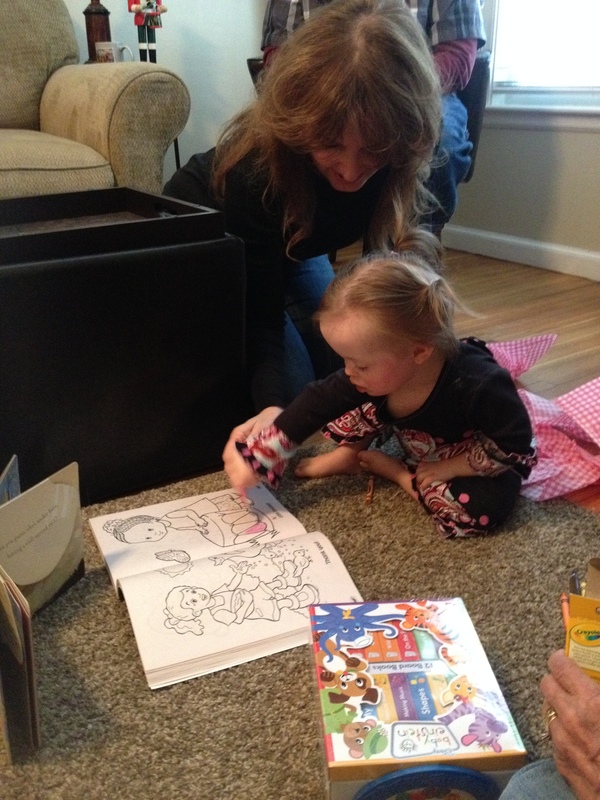 As joyous as a birthday celebration is, there is another side to Lily turning two. 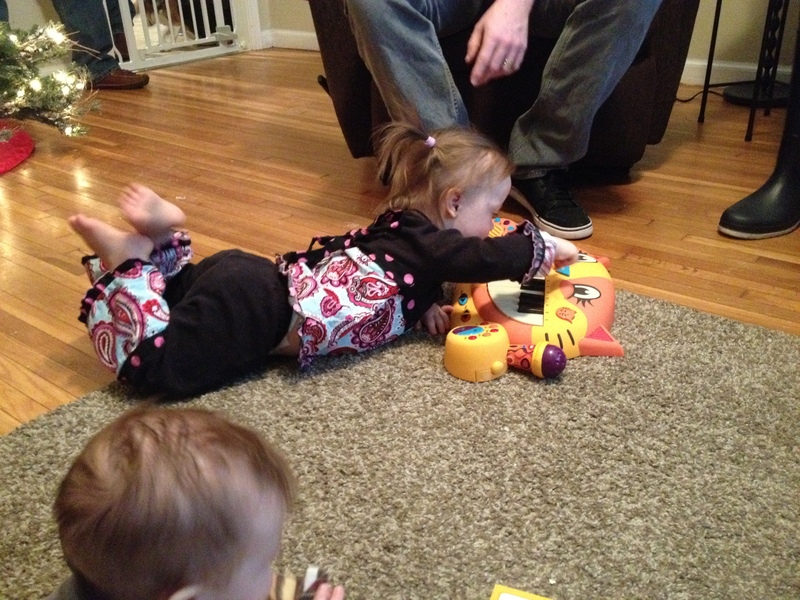 Her turning two also means an onslaught of doctor appointments, tests and evaluations. December is when we must face Down syndrome head on. 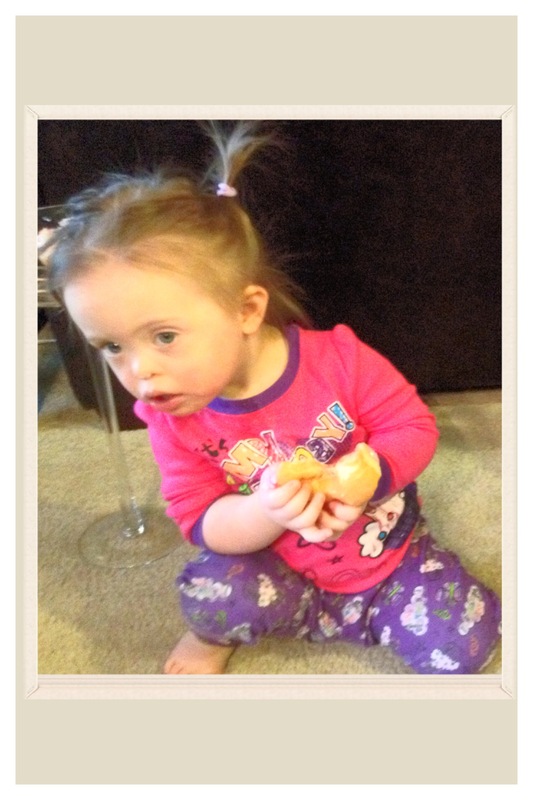 Dec 2011– Lily was born and we juggled being new parents with a preemie and Down syndrome diagnosis all at once. 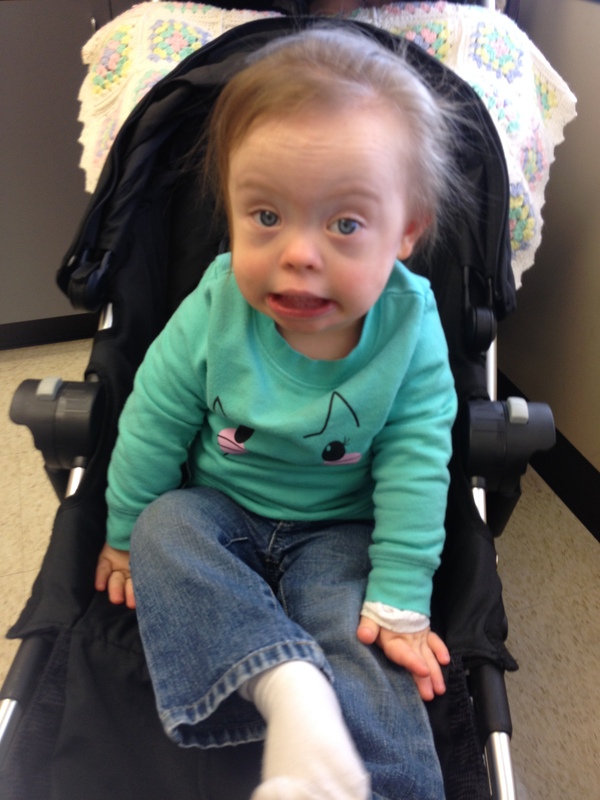 Dec 2012– We were waiting to hear back if Lily had bone and/or liver disease as some of her test results came back abnormal. Now contrary to what many may think, we do not actually talk about Down syndrome every day, we don’t really even think about it most days, and sometimes we even forget about it completely. As Lily is getting older, I admit it is harder to forget about DS but it still remains only a background setting to our lives, not our scenary. 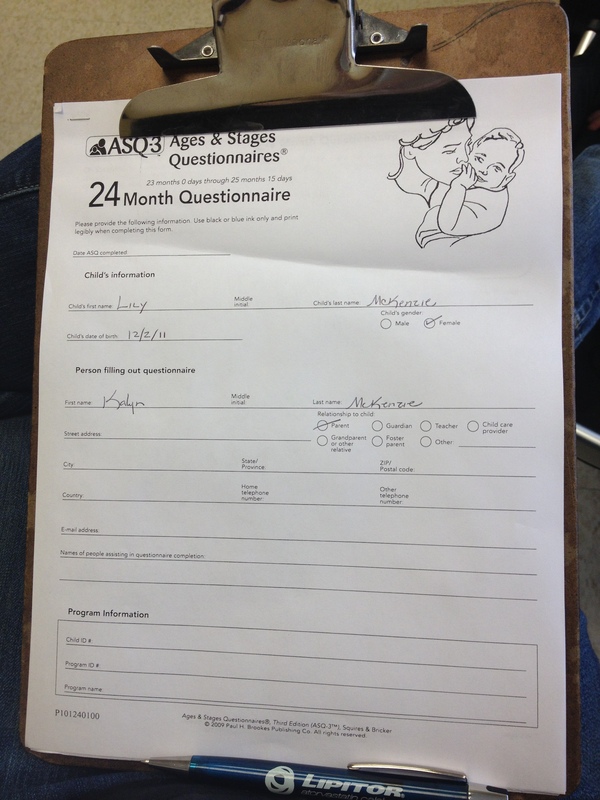 So when the very first thing I must do at the dr is fill out a developmental form for average 2 year olds, I feel the all too familiar, icy feeling of Down syndrome coming into the forefront of my brain and slapping my conciousness around. This time, I could harldly answer yes to any of the items listed. The only area I could answer yes in was in her problem solving skills. Although I am not blind, nor ignorant, I really had no idea just how behind (delayed) Lily is in her motors and communication. It stung. Next up was her regular pediatrician evaluation and discussion. I love her pediatrician and we always chat about the right course of action for Lily in her whole health. We made a plan and proceeded forth with the lab work. Lily has had her blood drawn plenty of times and I am always in awe at how well she handles herself. She did not disappoint this time either. This time her brother Oz, now 5 months old, was with us and he was very unsettled by the experience. I got my first glimpse of what an amazing brother he is and will be- as Lily cried, he began yelling and even growling at the techs! Next up, Lily meets with a developmental pediatrician. She is wonderful too and is helpful at looking at the overall picture of where Lily is and how she is doing. Since medically we are waiting test results, we focus more on development. Lily’s inability to walk stirs up all sorts of emotions within me. Some I prefer not to share and others I just don’t really understand. Will Lily walk? Yes, most likely. So why do I care that she can’t walk now? Well, I guess I am just like every other parent, I hate that my child is delayed in something. I hate that she wants to do something but can’t. I hate that all of her friends can walk except for her. 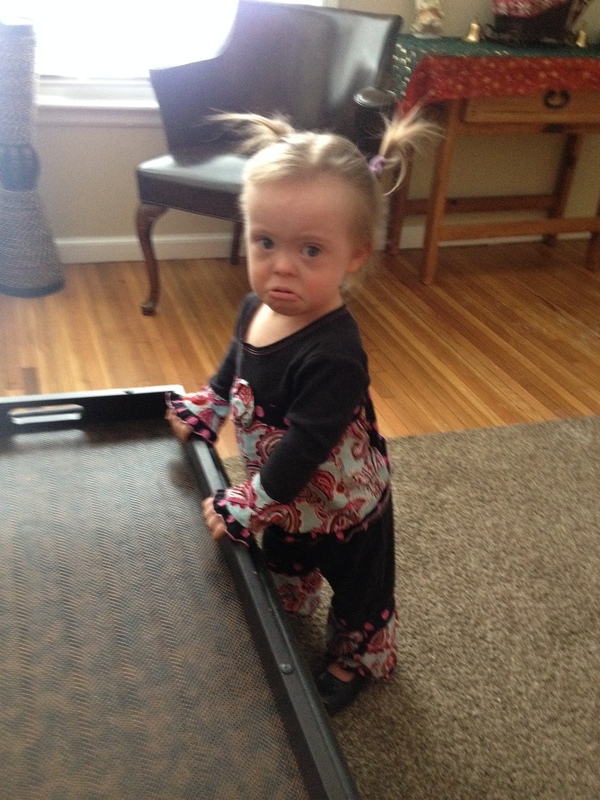 I hate putting on a happy face and agreeing that she will walk in her own time and yes, she is an excellent crawler. I hate that I feel this way at all. But I do. And now I hate that Down syndrome is officially creating a barrier for her. So I pull up my boot straps and now we are going to PT 4 times a week as well as working harder at home. (This is in addition to Speech therapy 2 times a week) Holy crap. As for the less dramatic but equally important information: Lily is speaking at a 12-15 month old level, she is only mildly behind in her fine motor (nothing anyone is concerned about) and advanced socially. 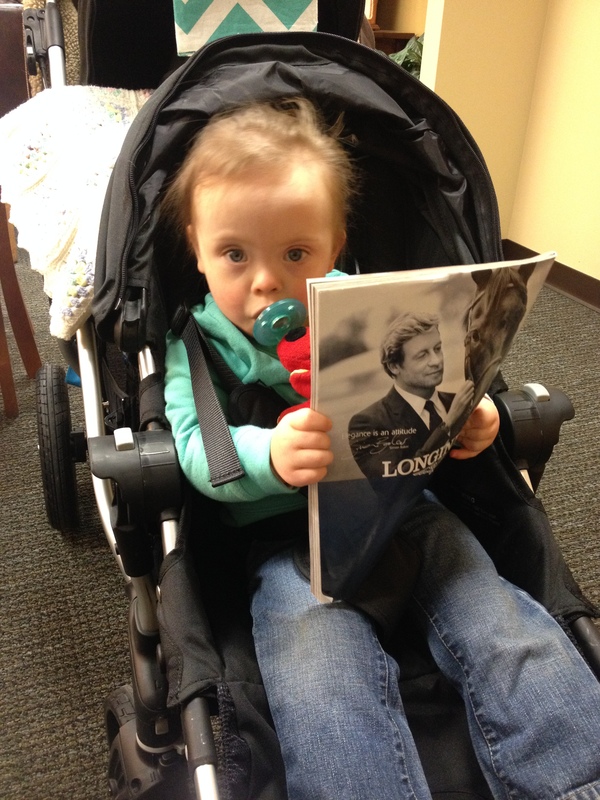 So that is our plan for her developmental delays- more therapy! We can do that! Back to the medical: Lily gets tested for thyroid every 6 months to a year. 60-70% of people with DS have a thyroid problem and take medication for it- we know several who already have begun treatment. Although it is not a guarentee that she will have it, it is likely. Every year she gets tested for Leukemia. Children with DS have a higher risk of having leukemia and that risk never goes away- she will have a CBC (blood count) done for the rest of her life. This time we requested she be tested for celiac disease too- it can be common with DS and she seems to get red cheeks after eating grains. (I read somewhere that that is a symptom). Elevated TSH (Thyroid Producing Hormone)- but normal T2, T3 (thyroid hormones). This may or may not mean anything. We are now waiting on the Endocrinologist we saw last year to review the results and decide what he would like to do. As I look at my little girl, I see so many things. I see big blue eyes, I see a fierce independent streak, I see a drive to accomplish whatever she sets her mind to, and I see an inner beauty that together with her outer beauty makes her quite striking and amazing. As she gets older, I also see Down syndrome. 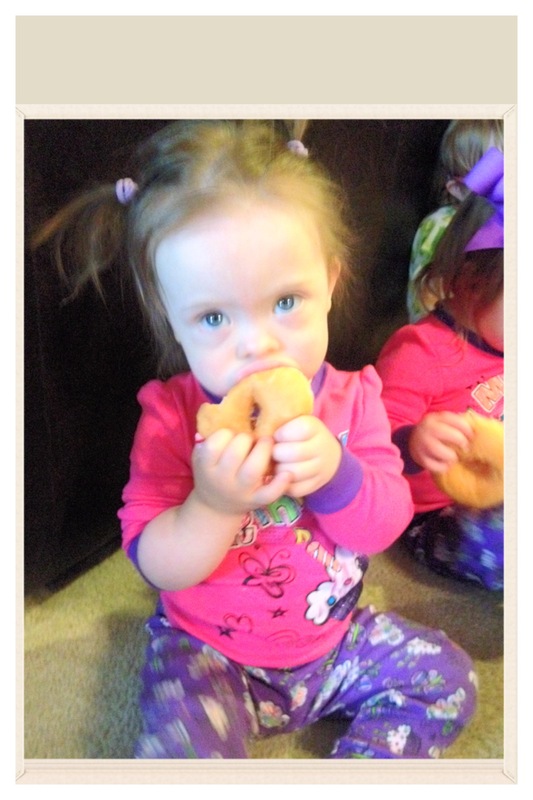 Down syndrome has shaped her eyes into an almond mold, made her ears and nose small, created smaller bones and a shorter stature, made her have to fight and struggle for everything she does, it is respsonsible for her inability to walk, created a frustration in her that is intense and stripped her of her confidence around groups of children. 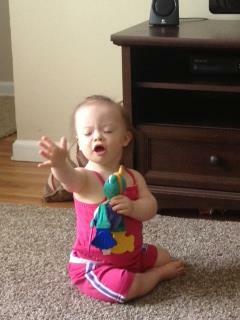 Down Syndrome is not who my daughter is, it is not a persoanlity trait, it is a barrier that holds my daughter back. Sometimes I imagine having a sword fight with Down syndrome. Although an intangible thing, it is my foe and it hurts my daughter. I do not love Down syndrome. I am not grateful for Down syndrome. During the month of December, amongst all my joyous celebrations I also wage battle with an enemy. A battle that Lily and I are determined to win everytime. 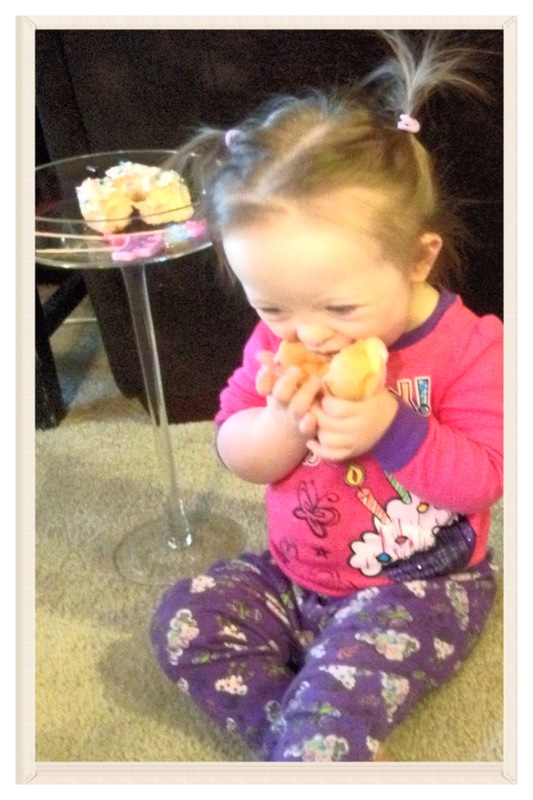 Lily just turned two and she won this battle over Down syndrome! Happy Birthday little girl, shade of my heart- you are healthy and beautiful and we love you so very much! 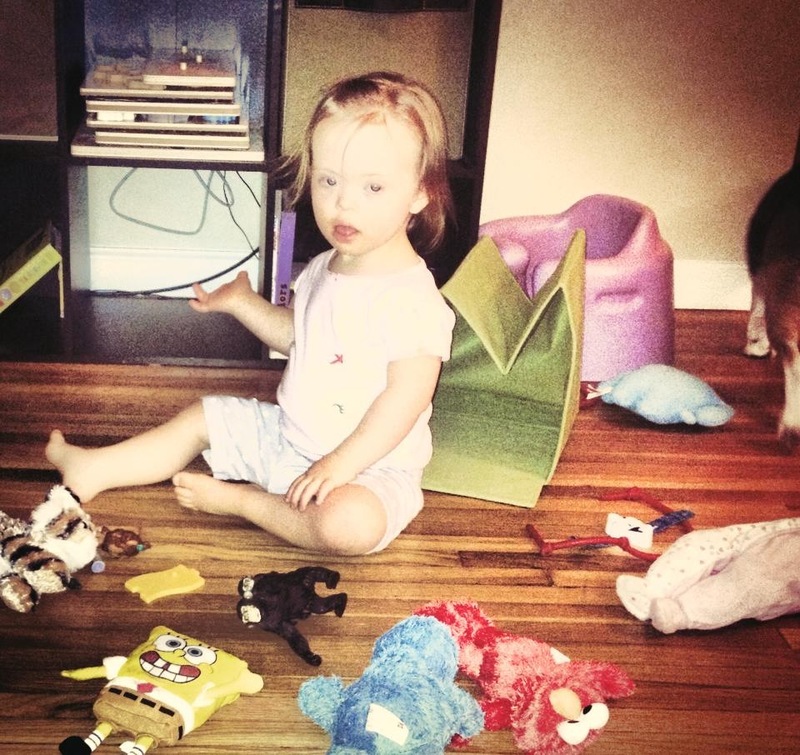 A diagnosis of Down syndrome comes with many things. Most of which sound scary, especially the list of potential medical problems. From heart problems to thyroid to respiratory, the list can be overwhelming and intimidating. Children with DS even have their own Pediatric Guidelines for testing. Lily has no heart problems. This is huge, as many of her friends are members of the mended hearts club. She is and will be tested annually for any thyroid problems. This involves a blood draw. In Lily’s young life she has had several blood draws. When she was 3 months old she spent 9 days in the hospital with pneumonia. As scary as that time was, nothing compares to last December. Lily has had trouble gaining weight – this is common for children with DS and can be the first indication of thyroid problem. So her pediatrician ordered a blood test. Here they would test for a slew of problems including leukemia. Lily’s blood test came back with high phosphotase levels. A second blood draw, and a consult with an endocrinologist later we were told she may have bone or liver disease. To rule it out she had to endure yet another blood draw and a bone scan of her entire body. She had so much blood drawn, she was put on a 30 day suspension from any further blood draws- meaning she had no more to give and needed time to allow her body to recover. The bone scan consists of x-raying every bone in her body. 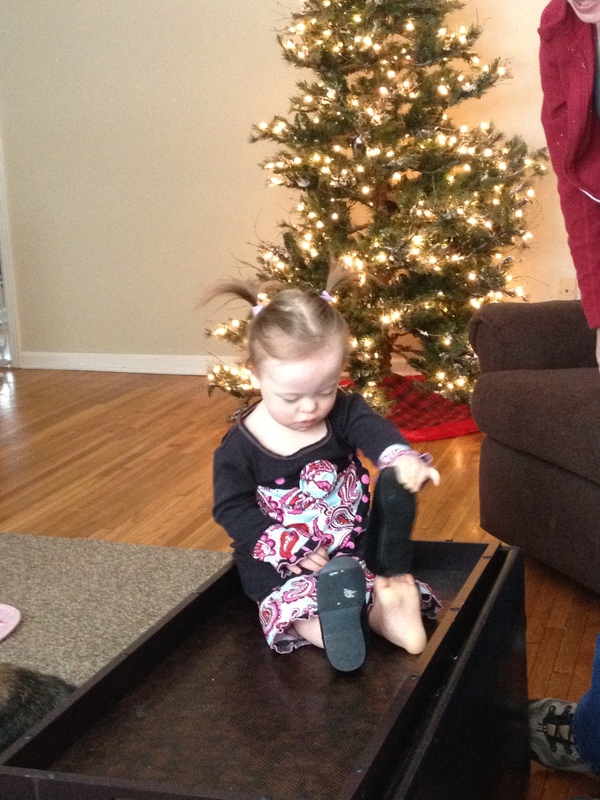 Not painful but a little uncomfortable and very scary for a 1 year old. The day Lily had the bone scan was a hard one for this mama. I was pregnant with her brother and could not be in the room with her. Knowing this ahead of time, her Aunt Sarah was able to come and take my place to guard over her and offer her comfort. I sat outside the room and listened to her cry for what seemed like eternity. I knew she was in hands as good as my own with Sarah but I still ached to go in and ‘save her’. Once completed, the waiting game began. Her Endo Dr said he would call if there was bad news and send a letter if it was good news. Obviously we prayed for a letter and jumped every time my phone rang. Days passed and we got the glorious letter we hoped for (well sort of). It stated that ‘nothing noteworthy was seen” but also said a follow up blood test would be needed to rule it out completely. It is truly strange the thoughts that run through your head when you are waiting to hear if your child is about to be diagnosed with a life-threatening disease. Or rather, the absence of thought. The looming threat over our daughter’s life was too big for me to digest at that time so I didn’t. There have only been a handful of times I have actually got down on my knees in prayer. I pray daily but not usually in that form. 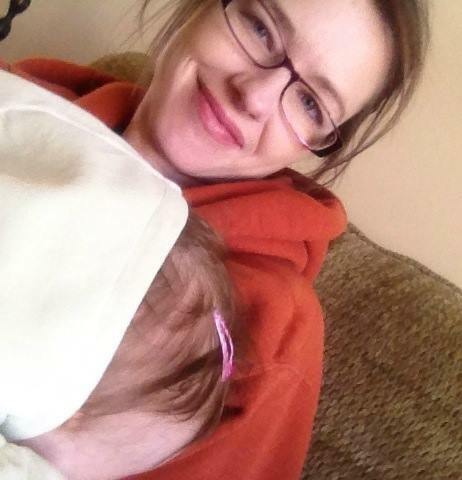 I dropped to my knees and prayed, begged for my daughter. I have felt God several times in my life and know His presence well. As I took comfort knowing He was there, my phone rang. I answered. On the other end of the phone was her dr. When he said who he was, I laughed nervously and told him he is not supposed to call me because that meant bad news. He told me that he usually never calls but felt compelled to call and tell me himself that Lily was fine. She did not have bone disease. She did not have liver disease. He didn’t need to see her again. Since that time, Lily has remained healthy with no real concerns. She will continue to be tested every year for the various things that can haunt a person with DS and we will continue to pray for her health.